Open Access week is an important week. A week dedicated to highlighting the importance of Open Access and advocating for free, and immediate online access to scholarly research. This year’s theme, “Open in Action,” is all about taking concrete steps to open up research and scholarship and encouraging others to do the same. This was the purpose in creating an open access blog; a way to share research MU faculty choose to publish open access. Every few weeks, I post about an open access article, right here on our library news page. When typing up the post, I focus on the research itself, the academic accomplishments of the faculty, and the most important, the reasons why they chose to publish in open access. I've received several insightul thoughts on why they think open access is important, and to my great delight, all look fantastic as graphics. 😉 Marketing material aside, they are profound thoughts that I hope will strike a chord with other MU faculty, and scholars outside the university, further engaging others and promoting the open access initiative. October 22nd-October 24th, I presented a poster at Merge&Converge'16, the 2016 Mid-Continent Medical Library Association conference. I wanted to show others that promoting open access, and engaging faculty is easier than we think. 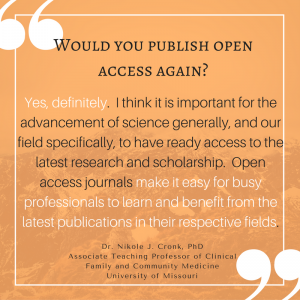 Faculty can be open access champions. 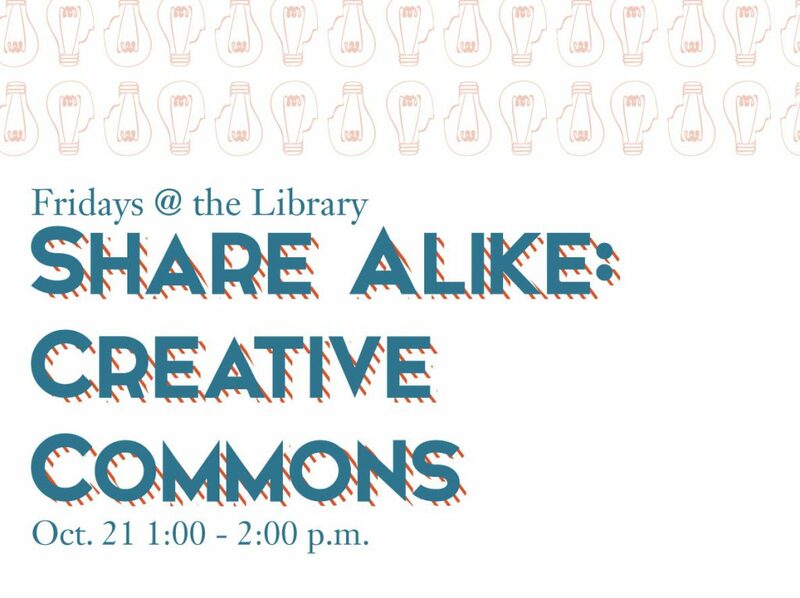 This Fridays @ the Library workshop kicks off our Open Access Week activities! Click here for more information on Open Access Week 2016. 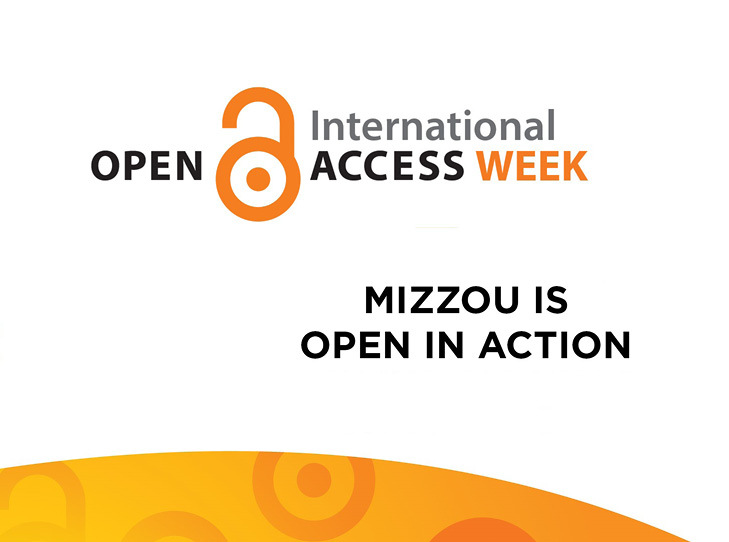 MU Libraries are celebrating Open Access Week 2016 from October 21-28. 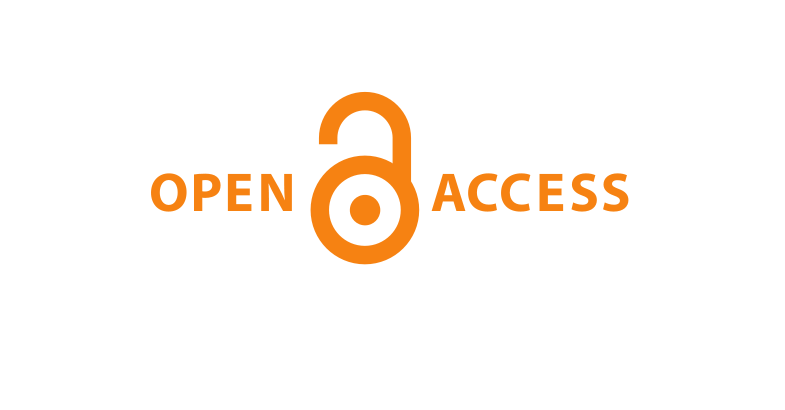 How can you participate in Open Access Week 2016? 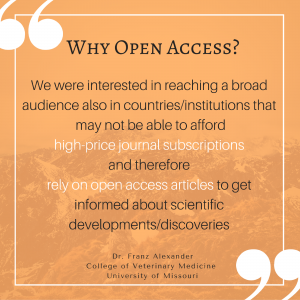 Learn more about Open Access: What is Open Access (OA) and why does it matter? Attend an Open Access workshop: We have 2 workshops for OA week. Need to make your research publically available? This session will provide an overview on complying with Public Access Policies from funding agencies such as NIH and NSF. 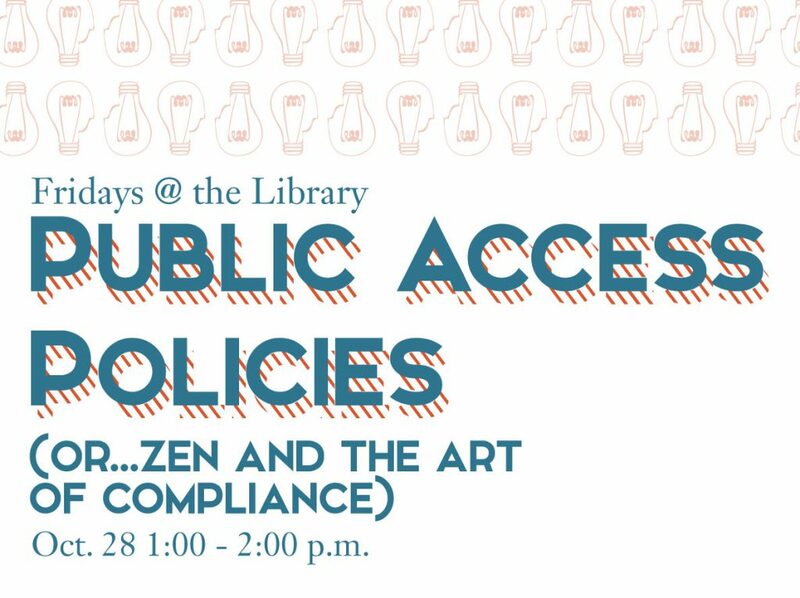 Topics will also include a brief overview of Open Access journals and how they relate to agency policies. 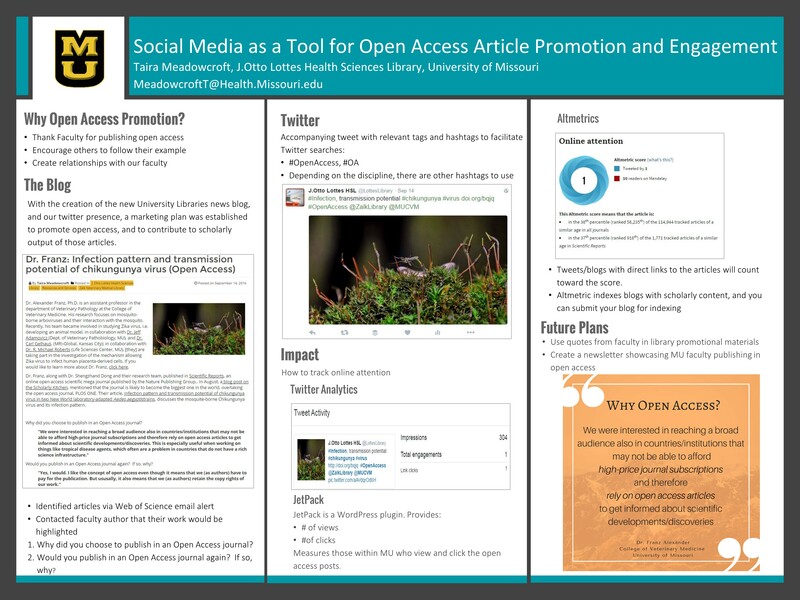 To spread the word about Open Access Week, feel free to share this OA Week blogpost, OA Week flyer, or OA Week poster! Did you know that several of our peers have Open Access policies (even KU!)? 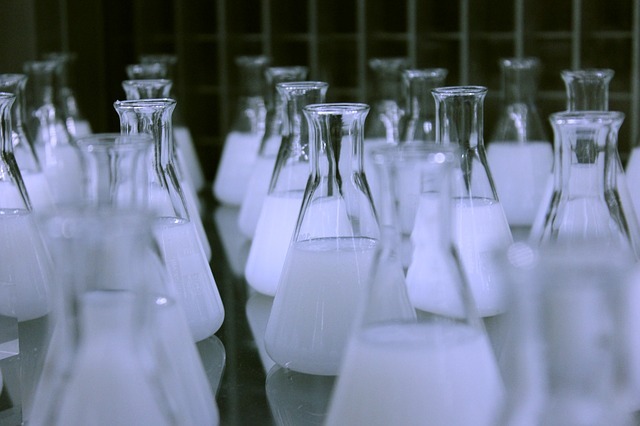 These policies help ensure that faculty make the products of their research freely available to all. For example, the KU’s Faculty Open Access Policy grants the University the right to deposit scholarly works to KU ScholarWorks, KU’s institutional repository. Under these university OA policies, authors retain copyright and can receive waivers in order to opt out of the policy for specific articles. Find out more about faculty-led Open Access policies from the Coalition of Open Access Policy Institutions. While MU does not currently have an Open Access policy, the University Libraries encourage you to retain your rights; make your work Open Access; and deposit your work to MOspace, MU’s institutional repository. Find out how. Celebrating Open Access Week: Don’t Sign Away Your Rights! Traditional publishers’ agreements often transfer copyright from the author to the publisher, giving them the right to reproduce and redistribute your work. The most important thing you can do is read your copyright transfer agreement. Don’t like what it says? You can amend the agreements to retain the rights you need to make copies of your work and to share it with others. What is the publisher requiring of you? Those agreements that require you to transfer all your rights limit what you can do with your own work—that is, you are no longer the copyright holder. If your publisher agreement reads something like: “the undersigned authors transfer ownership of copyright, including the right to publish and distribute the work by any means, method, or process whether now known or to be development in the future, to the Publisher,” consider amending the agreement. Publishing agreements are negotiable. 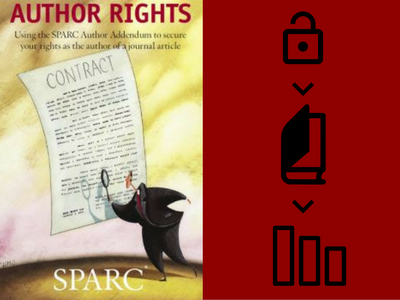 Know your rights and consider using the SPARC author addendum to modify your agreement. If you’ve retained the right to post to an online archive, submit your work to the MOspace Institutional Repository. An institutional repository, like MOspace, is one of the best ways to disseminate and preserve your work. As an Open Access tool, MOspace ensures that current and future generations of scholars benefit by finding your work. More information on retaining your rights. Dr. Chung-Ho Lin, PhD., is an Assistant Research Professor in the School of Natural Resources. Dr. Lin's primary research involves the use of plants and genetics modified microbes for applications in the area of phytoremediation and bioremediation in agroforestry. Click here to learn more. Dr. Jane McElroy, PhD., in an Associate Professor of Family and Community Medicine in the School of Medicine. Dr. McElroy's research interests include cancer and chronic disease, environmental exposures with metals, and geographical information systems. Click here to learn more about Dr. McElroy. Dr. Suan Nagel, PhD., is an Associate Professor of Obstetrics, Gynecology, and Women's Health in the School of Medicine. Dr. Nagel's clincal and research interests include endocrine disruption, fetal origins of adult disease, and epigenetics, to name a few. To learn more about Dr. Nagel, click here. This research team published in the open access journal Environmental Health Perspectives back in March. 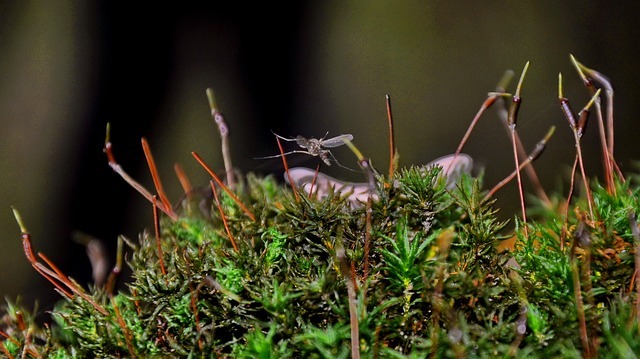 Environmental Health Perspectives is "a monthly peer-reviewed journal of research and news published with support from the National Insititure of Environmental Health, National Institutes of Health, and the U.S. Department of Health and Human Services." Their article, Endocrine-Disrupting Chemicals and Oil and Natural Gas Operations: Potential Environmental Contamination and Recommendations to Assess Complex Environmental Mixtures, is a commentary on hydraulic fracking technologies and the potiential for environmental release of oil and gas chemicals and potential endocine-related health effects from exposure to the hazardous chemcials. 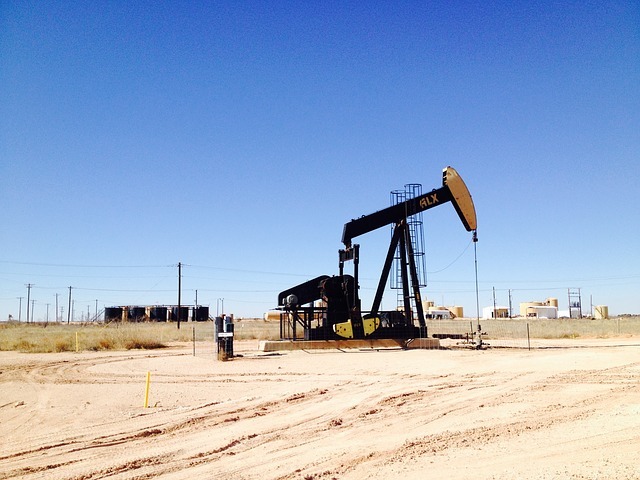 They describe a need for an endocrine componement to health asssessments conducted in regards to hydraulic fracking.